The quarry is located 30 miles south of Price, Utah, at the end of a graded road. Look for the "dinosaur" signs at road intersections. Room-size boulders scattered about the area create a unique setting for the exhibit buildings, picnic facilities, and the self-guided Rock Walk Nature Trail. Fri, Sat, Sun early March - Memorial Day. All of the funds collected stay right at the site and are used for operations and improvements. The road to the Wedge Overlook climbs through rolling pinyon and juniper woodland until it ends suddenly at the edge of the Wedge Overlook, sometimes called "Utah's Little Grand Canyon." Over 1,200 feet below, the San Rafael River winds its way between the canyon walls. The Buckhorn Draw portion of the Backway follows a narrow, winding sandstone canyon. South of the San Rafael River, the Backway travels through open range lands and pinyon-juniper terrain to I-70. After leaving paved highway SR-10, this graveled Backway is graded regularly and is passable for two-wheel drive vehicles in good weather. The road is occasionally impassable during winter months due to snow or wet conditions. Learn More Information by Visiting Utah.com. This park offers a very pleasant, modern campground on the banks of a picturesque reservoir. 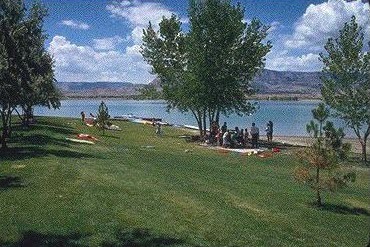 The reservoir is a popular place to boat, fish and engage in water sports. To get more information visit Utah.com. The San Rafael Swell Mountain Bike Festivals are held each spring and fall at The Wedge Overlook located southeast of Castle Dale, Utah. From the beginning, the Festivals have been geared to a wide-range of mountain biking enthusiasts - from the novice to the seasoned; from the occasional to the frequent; from the single rider to the family of riders; and from the rider(s) whose sole interest is the picturesque surroundings to the rider(s) whose sole interest is in the merits of the bike. Rides vary in degree of difficulty, each offering a different perspective of the beautiful San Rafael Swell. There really is a ride for every interest. For more information visit the MECCA Bike The Swell website. The San Rafael Classic Triathlon, held each year at nearby Huntington State Park, is a popular event with locals and visitors alike. Free campling, live music and a peaceful setting are just a few of the reasons the San Rafael Classic Triathlon is a great event to participate in. For more information, visit their website at http://www.sanrafaelclassic.com. One of the most scenic marathons held in Utah is only minutes away from Cleveland in Huntington Utah. The breathtaking scenery attracts both runners and walkers. A marathon, 1/2 marathon and 10K will be offered. Each race is limited to the first 500 entrants. Please avoid race-day registration, we may have room for you, but there is no guarantee of a finishing medal or shirt if it is 2-weeks before the race. We will order extra, but it will be a first-come, first-serve basis. For more information, visit their website at mammothmarathons.org/little-grand-canyon-marathon. The Little Grand Canyon is considered to be one of the hidden treasures of the world and we look forward to seeing you there!